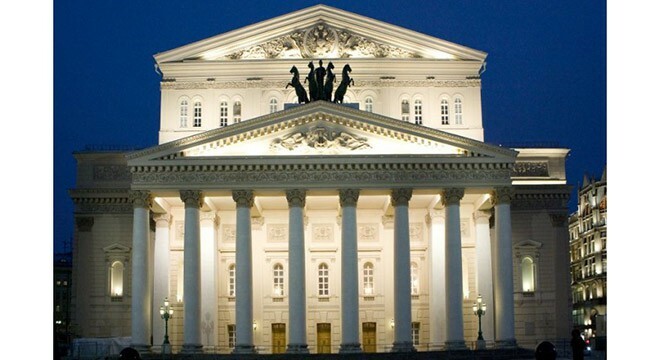 The Bolshoy Theatre – one of the most significant largest opera and ballet theaters in the world. The complex of buildings of the theater is located in the center of Moscow on Teatralnaya Square. The whole history of theatrical culture in Moscow for many years been associated with the Bolshoy Theatre. The history of the theater decided to start from March 1776, when Empress Catherine II ordered to “keep … all kinds theatrical performances, as well as concerts and masquerades” to Prince Peter Urusov. Prince began the construction of the theater on Petrovka Street – that’s why it was named Petrovsky. Urusov Theatre burned even before its opening, and the prince handed the case to his companion, the English entrepreneur Michael Maddox. Under the leadership of Medox in the years 1776-1789 was built Bolshoy Petrovsky Theatre by architect Christian Roseburg. The three-storey brick building with white stone elements cost 130 thousand rubles. The grand opening took place on 30 December 1780. The theater had the parterre, three tiers lodges and gallery, contains about 1 thousand. audiences ‘ … Luxuriously decorated boxes cost from three hundred to one thousand rubles and more. A ticket in the parterre cost one ruble. “. During the period that Madox is owned theater there was played 425 opera and ballet performances. In 1794, Maddox had financial difficulties, so that he gave the theater to the treasury; It became the Imperial Theatre. October 8, 1805 the building burned down, so during three years, the troupe gave performances in home theaters Moscow nobility. The new wooden building was built by Carlo Rossi on Arbat Square, unfortunately it existed only four years, the theater building burnt down during the Moscow fire of 1812. After that, the theater is located in a house on Znamenka in Apraksins’ house. In 1816, the Commission of the structure of Moscow announced a tender for the construction the new theater building, the main condition was included in the construction the burnt walls of the Medox theater. The competition have taken part many famous architects, but not a single project has been accepted. The winner of the re-competition was a project of professor of the Imperial Academy of Arts A. Mikhailov. This project was considered too expensive, so the processing of the project entrusted to the architect Osip Bove, which is completely kept the foundations composition of Mikhaylov, but changed the proportions of the building and adjustments in its exterior and interior .. According to the Bove idea the Theater had become the compositional center of the city, glorified the victory in the Patriotic War. In front the theater was built a rectangular square (now it’s called the Teatralnaya Square). The theater opened 6 (18) January 1825. The first performance was “Triumph of the Muses”: the story allegorically described how Genius Russia, united with the Muses, from the ruins of the burnt Bolshoy Petrovsky Theatre constructed a new one. The roles performed by the best actors of Moscow. About this opening preserved Aksakov memories: “Bolshoy Petrovsky Theatre appearing from old, charred ruins … amazed and delighted me … Magnificent huge building, exclusively dedicated to my favorite art already one his exterior led me in excitement. In 1842 the Theatre came under the guidance the St. Petersburg directorate of the Imperial Theaters. March 11, 1853 the Theatre burned down; from the fire, which lasted several days, survived only the stone exterior walls of the building and the colonnade of the portico. A competition was held for the restoration of the theater, which was won by the project Kavos, the theater was rebuilt in three years. Since 1919, the The Bolshoy Theatre was called academic. During several years after the October Revolution there were many debate about destiny of the theater; many were in favor of closing it. The Presidium of the Central Executive Committee decided to close the Theatre would be economically impractical. So in 1921, the commission inspected the theater building and has come to the conclusion about the catastrophic condition of the walls of the auditorium. The work to strengthen the walls continued for two years. In the mid-1920s, the old curtain depicting Apollo quadriga was replaced by a new, made by drawing Fyodor Fedorovsky. November 29, 2002 the premiere of Rimsky-Korsakov’s “Snow Maiden” opened a new stage of the Bolshoy Theatre. In June 2005, on the main stage was the last performance of Mussorgsky’s opera “Boris Godunov” before closing the theater for reconstruction. Reconstruction of the Bolshoy Theater cost the state 35, 4 rubles mldr. Grand opening of main stage of the Bolshoy Theater held on October 28, 2011 For this time the director, chief conductor of the theater changed. Since July 2013, Vladimir Urin took over as CEO of the Bolshoy Theater. In the same year the theater was established a unique organ of firm Glatter-Goetz. Due to modern technology, broadcasting performances are held in different theaters of the world, and ballet performances already can be seen on channel «YouTube» in Russia.